I've said it before, but it seldom hurts to repeat myself: I've never been much for Halloween. 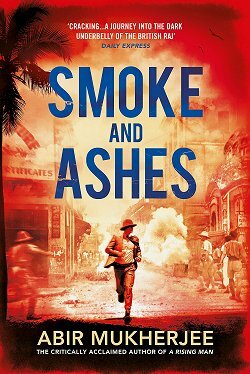 When (and where) I was growing up, it seemed a time for vandalism and greed, and I just never warmed to it. It wasn't until I moved to Arizona that I found a holiday I could embrace-- Dia de los Muertos, the Day of the Dead. 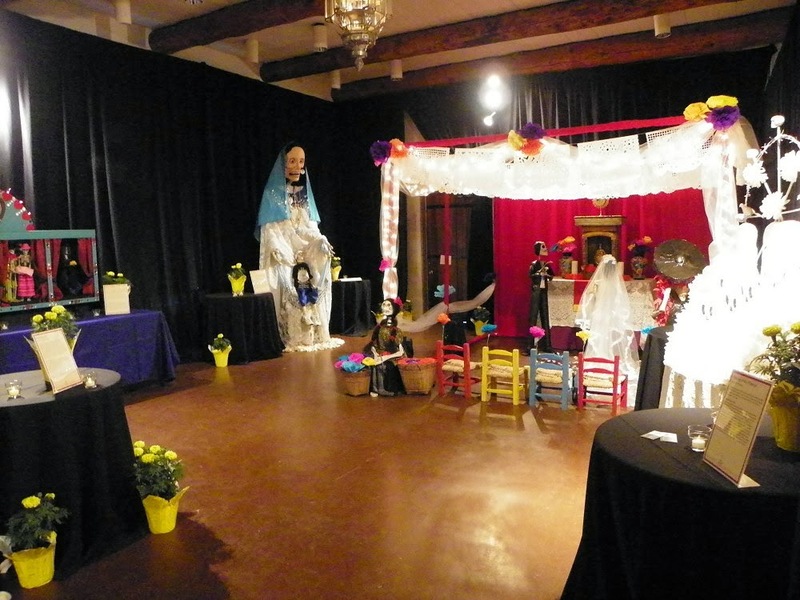 Assured that the dead would be insulted by mourning or sadness, Dia de los Muertos celebrates the lives of the deceased with food, drink, parties, and activities the dead enjoyed in life. Dia de los Muertos recognizes death as a natural part of the human experience, a continuum with birth, childhood, and growing up to become a contributing member of the community. 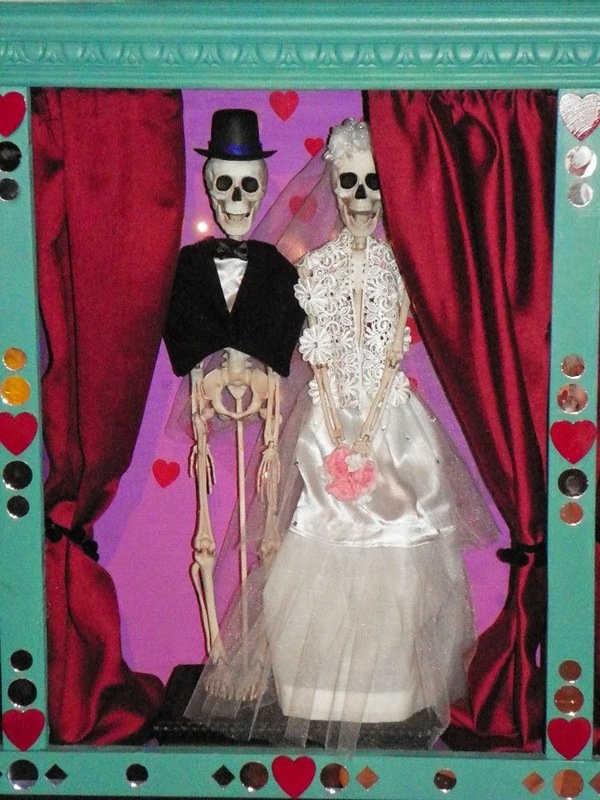 Dia de los Muertos has its own kind of art, an art many would consider to be macabre or ugly, but I find it whimsical and touching. 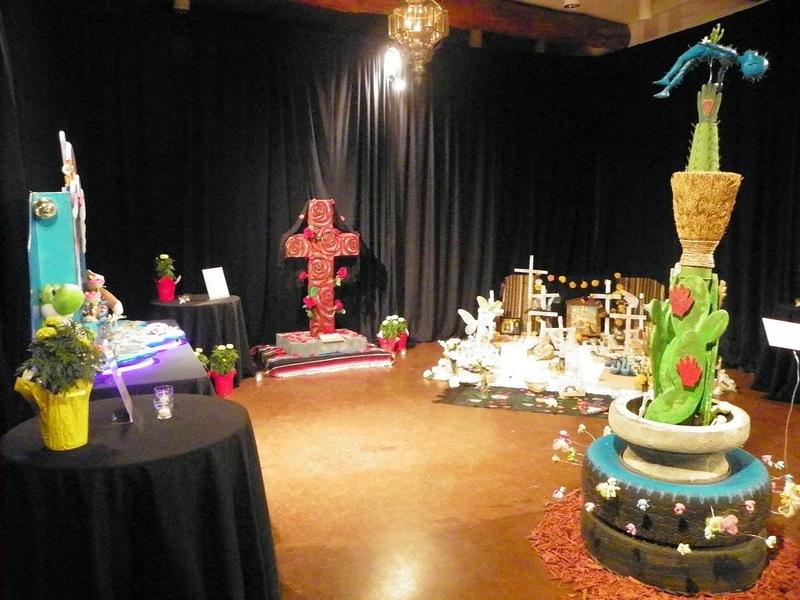 When I learned that the Desert Botanical Garden here in Phoenix celebrated Dia de los Muertos each year, I began to go in large part to see las ofrendas, the offerings made to dead loved ones. In the last few years, I started taking my camera so I could share this art with all of you. As I said, the art isn't for everyone. In fact, Denis didn't like it much when he first started accompanying me. But guess what? He likes it now, and enjoys going almost as much as I do. 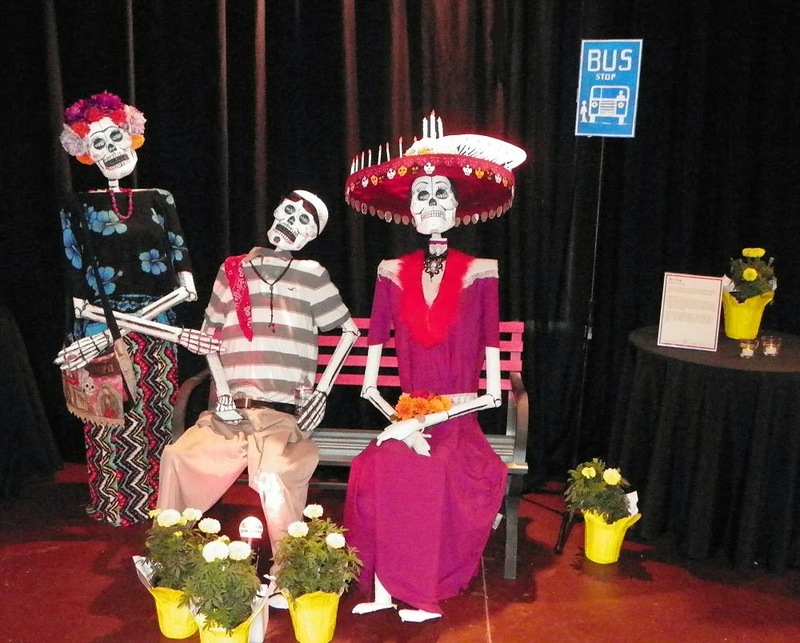 Without further ado, here are photos from this year's Las Ofrendas at the Desert Botanical Garden. I'll begin with three views of what you see when you first walk in from out of the bright Arizona sunshine. Click on any photo to see it full size in a new window. When the art has a description, I'll share it with you directly beneath the photo. 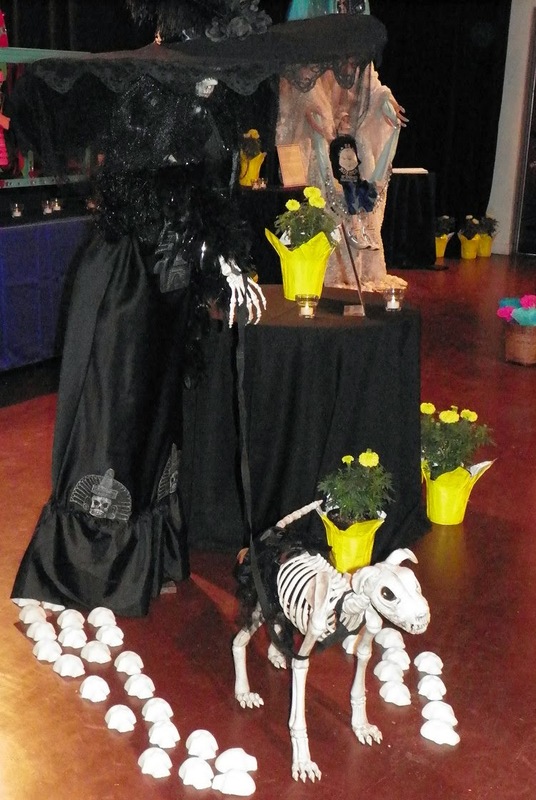 My ofrenda was created in effort to recycle materials such as Styrofoam, paper, and steel. 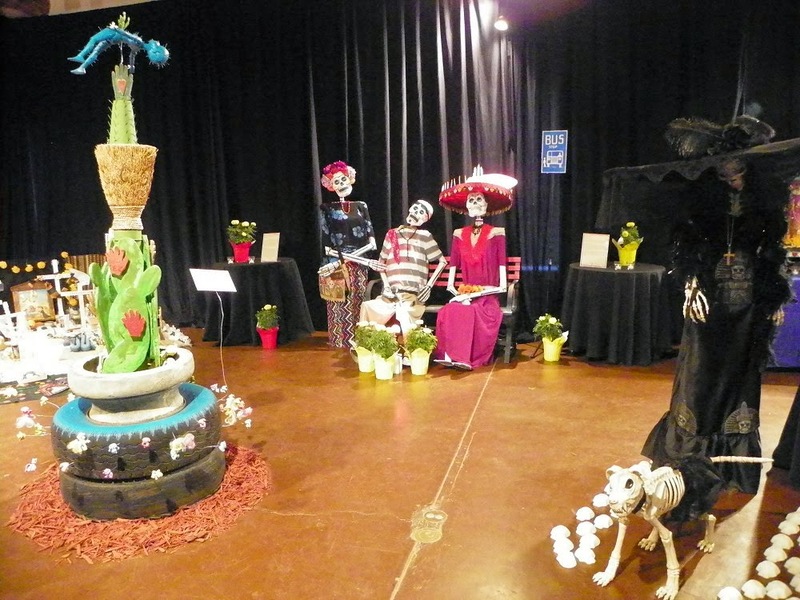 Recycled "muertos" gather to symbolize the importance of protecting our mother earth. Collectively our past, present and future actions need to consider her in every way. 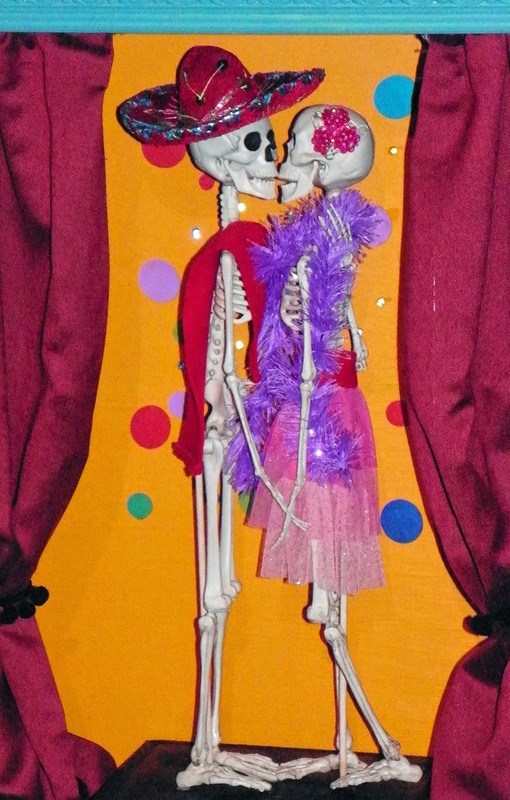 After many months of planning her Boda Perfecta, Maria Conchita De Delores was ready. In the background, the mariachi band is playing the wedding march and the bride is walking towards the altar to join her future husband, but right at that moment the bride's mother just found out that the lady sitting outside the church who's selling flowers is the present wife of her daughter's future husband. What does she do? She grabs the train of her daughter's wedding dress and tries to pull her away from the altar where Don Juan Jose Vaquero is waiting. La Novia (the bride) didn't know what was happening so her mother shouts, "His wife is selling flowers to feed their nine children!" The groom tries to stop her, but it's too late. The bride runs out of the church, stops at the flower stand and shouts, "La Boda Perfecta!" 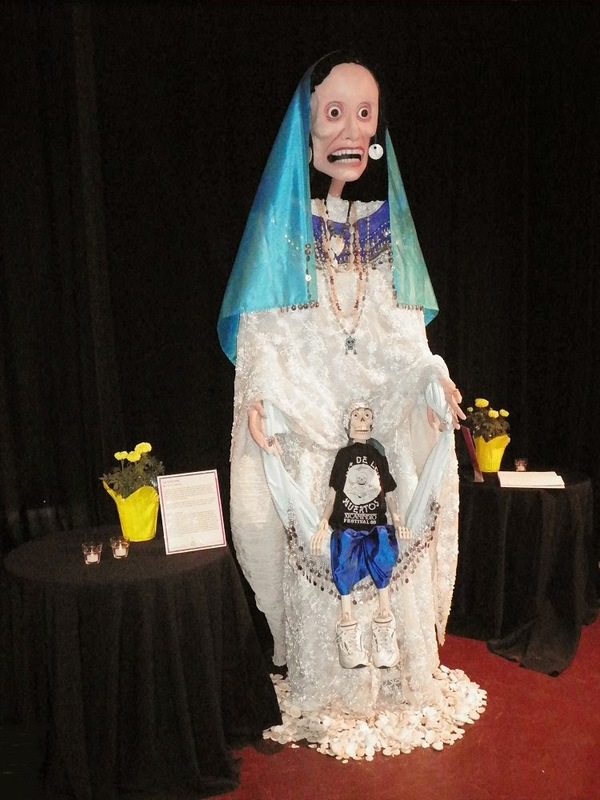 La Llorona is one of Mexico's most popular icons and a story told by parents to frighten their children to behave or to go to bed. According to legend, La Llorona drowned her children so that they would not witness the Spanish invasion. The ghost of La Llorona roams lakes, rivers and beaches in search of her beloved children. Most Mexicans believe that her chilling calls of "Mis hijos, mis hijos!" ("My children, my children!") can still be heard today. 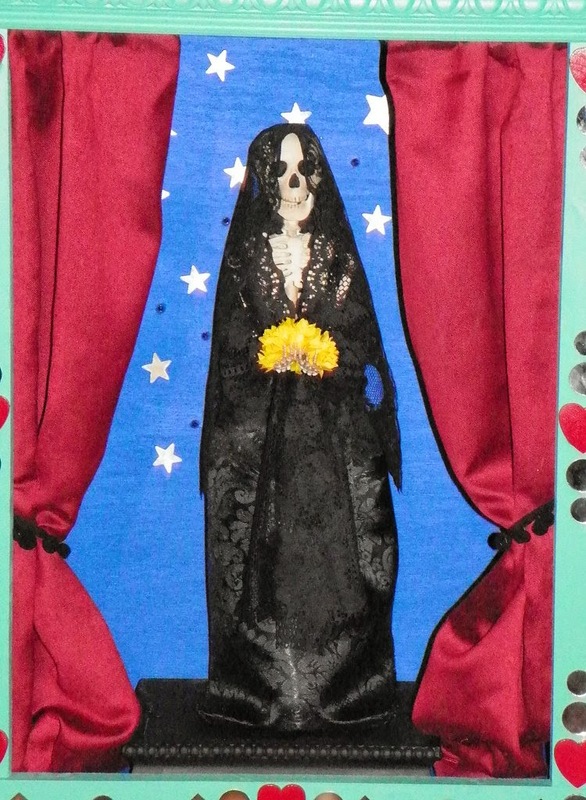 La Llorona is a perfect metaphor for the theme El Amor, El Humor y La Muerte. 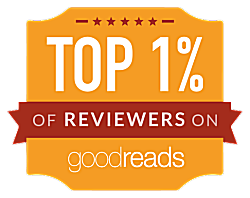 The story reflects how we deal with the fear of death with a pinch of humor, love for our family, as well as appreciating our ancient indigenous culture. 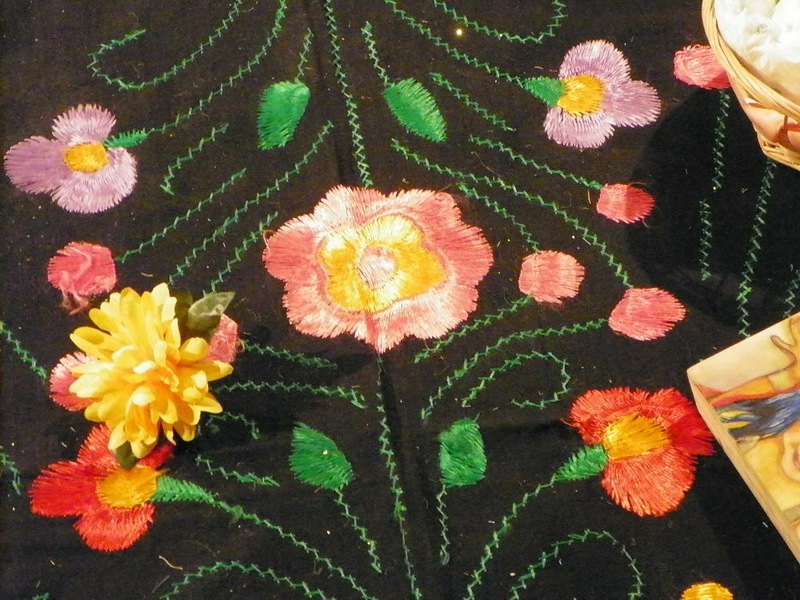 In Mexican culture, small decorated boxes called "Nichos" are commonly found in homes and public places, displayed on walls or pedestals. Made from wood or tin and often painted with bright colors, they provide a stage-like setting for an object that has great significance. Most commonly functioning as an altar for a religious icon, a Nicho can also serve as a memorial to a loved one or as a reminder of an important event. 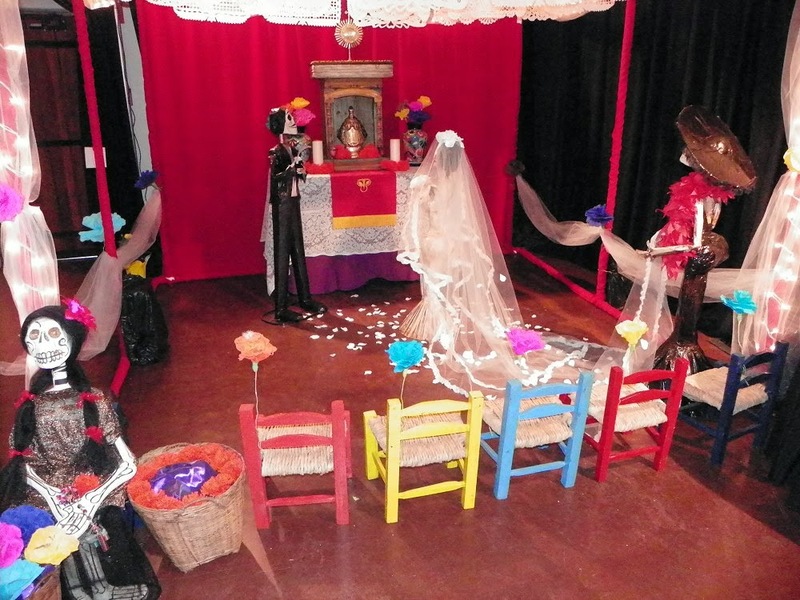 Beginning with passionate love and ending with eternal love, this four-part Nicho extends this tradition with an exploration of the "historia de amor"-- the "history of love." In the last Nicho, a widow is celebrating Dia de los Muertos in remembrance of her beloved, to make contact with his spirit, to let him know he is not forgotten. Life is eternal, love is immortal, and death is only a horizon; and a horizon is nothing save the limit of our sight. This altar was created in honor of my father. I never had the chance to meet him, as he passed away seven months before I was born. 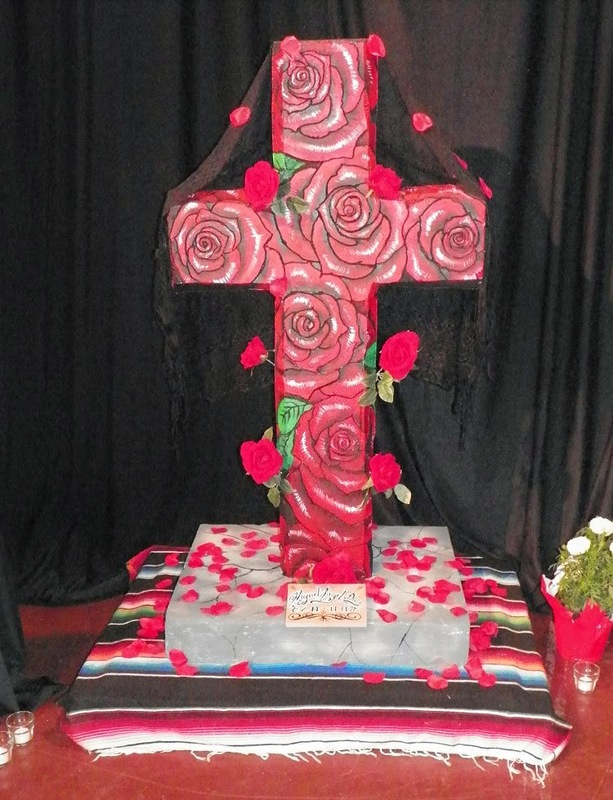 The seven roses represent the seven months he had been gone before I arrived. This is the first altar I've created in his memory, and it has been tremendously moving to honor him this way. 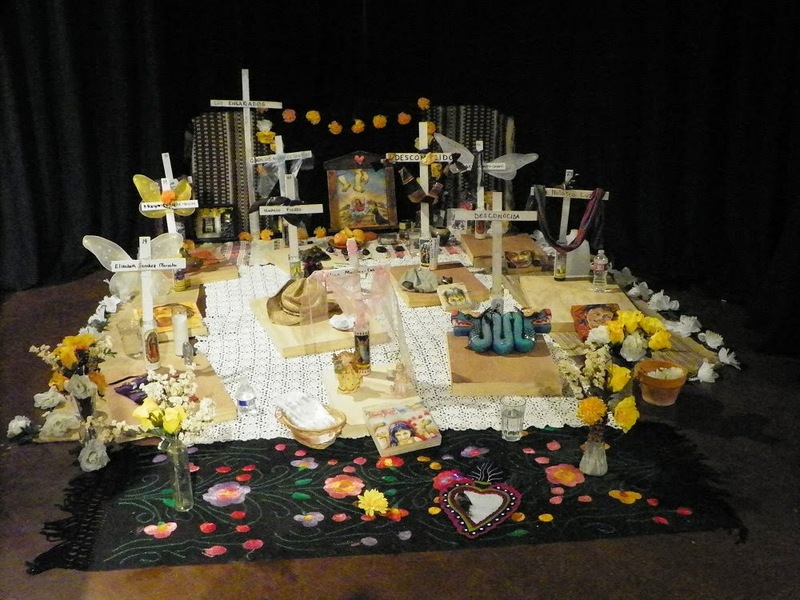 My ofrenda is a humble way to honor the spirits and souls of those who have died in our desert with the commitment to find peace and dignity on our border. I am deeply concerned about the continued deaths that have occurred to people from South America and Mexico when they attempt to cross our desert, which are often due to exposure and/or heat related. Since border policies were implemented in the 1990s, it is estimated that the remains of more than 5,000 men, women and children have been recovered on the US-Mexico border. These are tragedies, and such a human right crisis needs a viable solution. According with Coalicion de Derechos Humanos in Tucson, the number of human remains recovered from the Sonoran Desert between 2000 to 2013 are 2,649. Nikki was my Love and she took her life because she was filled with sadness and pain. But these things that overcame her are not what I remember or loved in her, and they will not be what define her for me right now. Rather, I will forever see her sparkling eyes and hear her dorky laugh. I will think of her when I hold the toys that made her happy and I will smile through my tears when I recall our moments of joy and play. She is more than her end, for her life breathed into me new paths and futures and so many wondrous memories that who I was before and who I am now are as strangers to each other. This is my memorial to her. This is my love song. This is our laughter intertwined and made solid, lasting, and beautiful. This is the Nikki I will hold in my heart until it beats no more. This is our love and our joy, and all the wonder of the life we had together. This altar honors the importance of dogs in Aztec tradition and the relationship between them and their beloved owners. Aztecs believed that dogs were needed to get their masters' souls to Mictlan, the underworld. 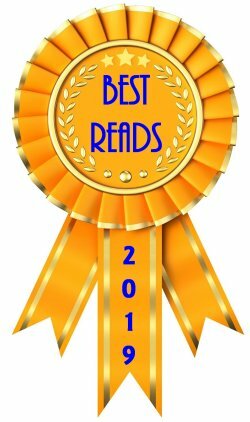 The journey through Mictlan took four years, and the dead had to pass nine challenging levels, such as crossing mountain ranges that were crashing into each other, a field with flesh-scraping knives blowing in the wind, and a river of blood with fearsome jaguars. The dead were aided by their lifelong canine companions: the Xoloitzcuintli. The god Xolotl gave Xoloitzcuintli to man with the instruction to guard it with his life, and in exchange the dog would guide man through the dangers of Mictlan and toward the Evening Star in the heavens. 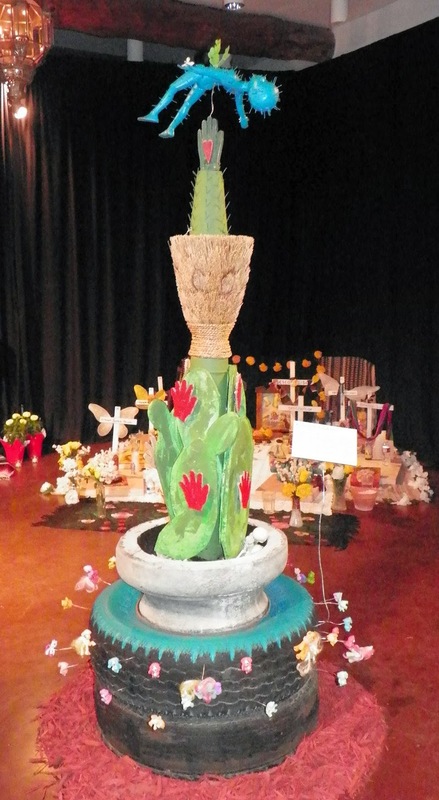 This altar is a whimsical take on Phoenix street life. It represents the colorful characters that can be found at a local bus stop. 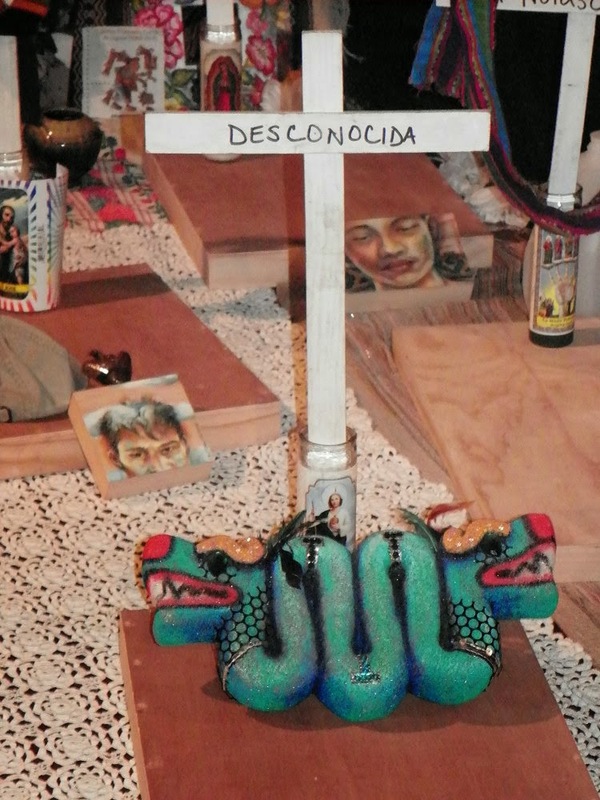 This Ofrenda is handcrafted with original photographs, painting, foam cuts, and mixed media collage. 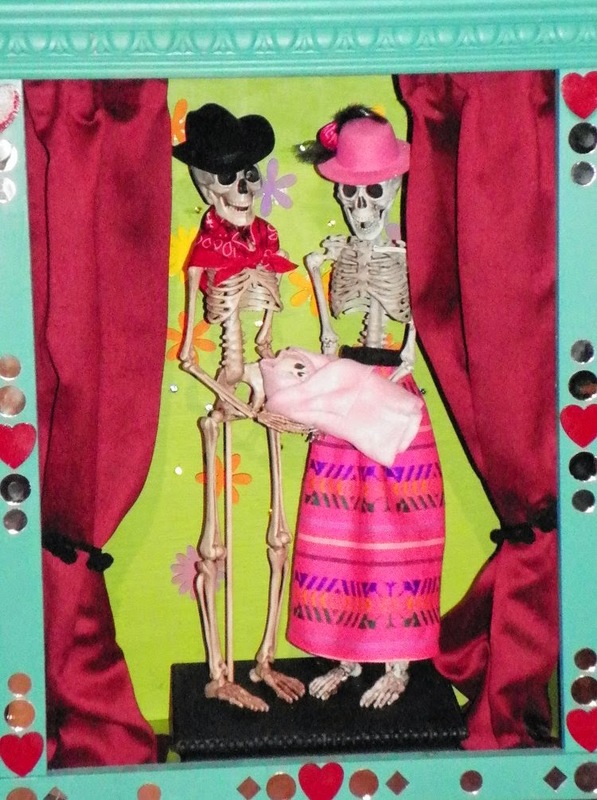 Each year I go to the Desert Botanical Garden for Dia de los Muertos and las Ofrendas, I always learn something new, and I always appreciate this colorful whimsical art that has such deep meaning. 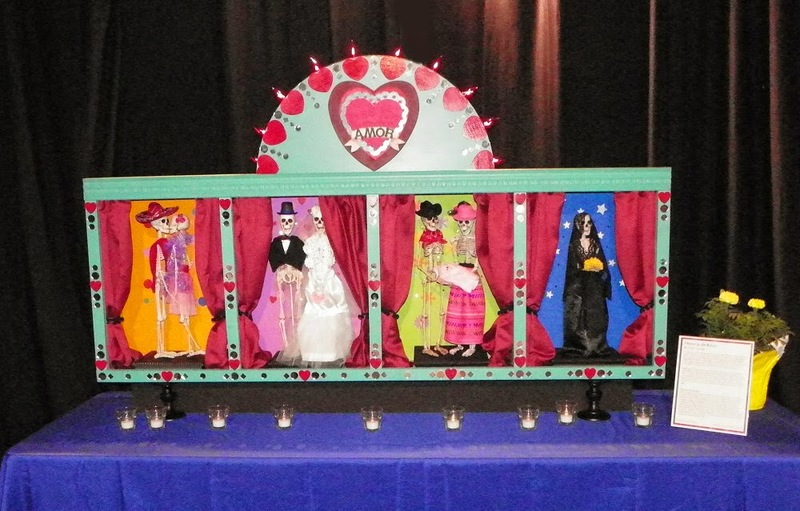 In fact, this year I've been moved to the point of deciding to make my own ofrenda at home next year. We shall see how that turns out! I said at the beginning that this art isn't for everyone. How about you? Do you like it? Or do you think it's just too macabre? Be honest! Inquiring minds want to know! Glad you found a holiday you like. a day to unabashedly eat the candy of my childhood available right around the corner. I don't go in for horror of gruesomeness or haunted houses. But I enjoy the costumes in my neighborhood. The New York Halloween Parade goes by near my house. 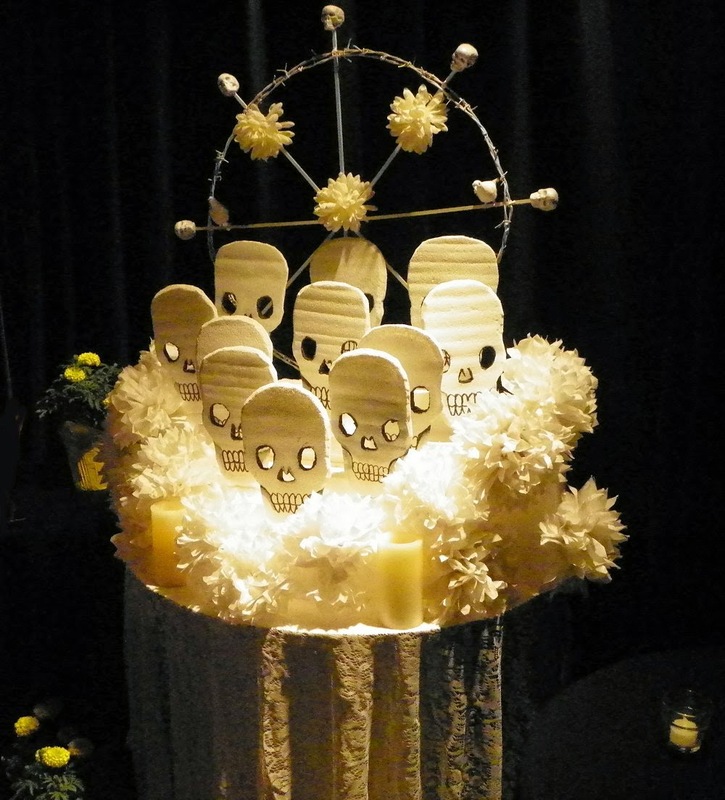 By the way, there's a LOT of food associated with Dia de los Muertos, so there's no need for me to miss out on that! Cathy - I love the connection between the art and the stories behind it. And I love the way the artists are very personal about their stories. Where I live, there's a large Latino population, so there are always several Dia de lost Muertos events. I didn't grow up in that culture but like you, I've learned an awful lot just from that art. Some of the art is, I admit, just a bit macabre for my taste. But some of it is beautiful (to me) and all of it shows talent and expresses a culture. I have nothing but respect for the cultures from Central and South America and the Latino communities in the U.S. But I'm just not into macabre or death-themed holidays or art. Even with Frida Kahlo, who I admire as an artist and for her principles, I can't deal with some of her more macabre art. It's just me. I respect everyone's personal taste though. I think this is because when I was a child, my mother left my sister and me at a production of Poe's The Tell-tale Heart at the local YMCA. 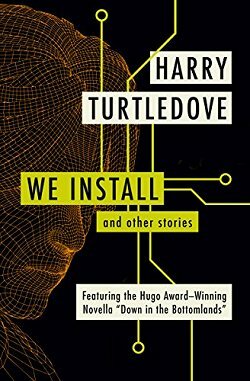 The heart was coming out of the wall, pounding and beating. You could see and hear it beating. I still have that imagine. So, I shy away from macabre, scary, horror, etc. As I said before, I certainly respect your dislike of the art-- just as you respect my like of it. And I do appreciate your explanation. I can see how that could have affected you as a child.